If you think Badges are a great idea and help people become better sailors, please LIKE this via facebook and g+1 it. Thanks it helps promote safety on the water. Earn Sailing Badges and Status by doing the right kind of activities on the water. This training system is FREE and gives you instant feedback on how you can be better. Why Do We Sponsor This? Boating is dangerous. Because of our extremely wide student body reach, coupled with deep technology implementations, NauticEd is uniquely positioned to take responsibility of promoting safe and proper boating habits worldwide. These include having a well maintained boat, being properly educated, regularly inspecting onboard equipment and having the proper practical experience along with other behaviors. Through our Status and Badge technology platform, we recognize and promote those individuals who exhibit the proper and responsible boating behavior albeit through anonymous user names for privacy. We believe this leads to a viral and peer pressure effect to make our global waterways more safe and enjoyable for all. Thus, this is no gimmick. When you participate in this effort, you are showing the world you’re also committed to safe boating and you’re encouraging others. Please participate to your maximum ability! How Do Badges and Status Work? Each Badge has associated and related behaviors called Activities. Each Activity has an assigned amount of points. You earn Badges by earning points from the related Activities. 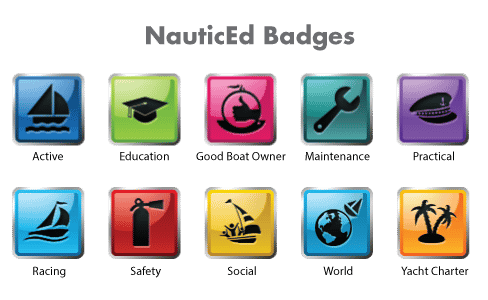 For example you are awarded points towards your Safe Sailor Badge if you check your fire extinguishers, inspect your rigging, have an onboard functioning and inspected EPIRB etc etc. You earn Status from your total accumulated points regardless of Badges. Higher Status and more Badges indicate your proper responsible behavior associated with boating. Some points expire: We do this because it is necessary to constantly keep vigilant with things on your boat. For example you’ll need to inspect your rigging and change your oil on a regular schedule. You’ll see this type of expiring points when there is a check box next to the Activity and we’ll send you an email to remind you of the correcting Activity to gain back the points (you can turn these off). In this we’re helping you keep diligent about your responsible boating behavior. Some points decline over time: We do this because your activity in the past, while important, has declined in its value. For example, if you sailed using a spinnaker this month, this is more practically valuable than having gone sailing with a spinnaker 2 years ago. You’ll see this type of declining point activity when you see an ADD button next to the Activity. “ADD” because you can repeat this behavior many more times than once. Thus the points accumulate but then decline over time. Some points are awarded automatically based on your NauticEd site behavior. For example, when you pass a course we know you’ve been educating yourself. When you go sailing and log the time in our online logbook we know you’re gaining practical experience. You’ll see these types of automatic points when there is no checkbox or ADD button. Yes this is mostly all build on the honor system. If you cheated a boy scout badge when you were young you probably feel pretty bad about it today. Be honest with thy self. We sincerely hope you participate. We’re sure that Status and Badges will lead to discounts with many participating and affiliated companies in the future. Start building your Status and Badges today!